Apple Is Giving Out ‘Jetpack Joyride’ For Free On Facebook. Grab Yours Now! Here’s a good news to all you iDevices owners. 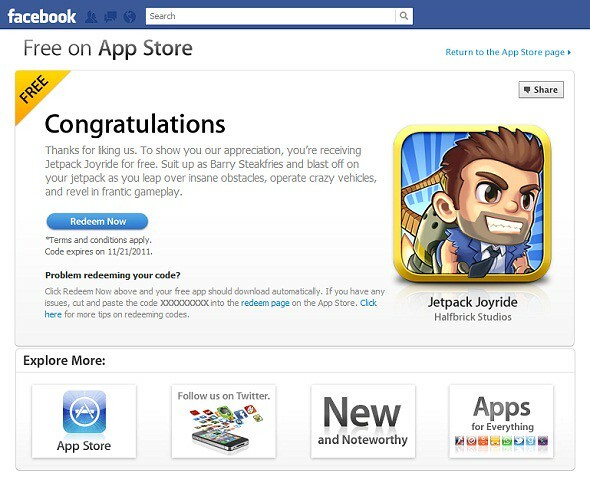 Apple is giving out a free copy of ‘Jetpack Joyride’ through Facebook. Now in order to get this free redeem code for your copy of ‘Jetpack Joyride’, just follow this link. Click on some ‘accepts’ and ‘likes’ and you will eventually get the code. Basically you just need to allow the Appstore app to connect to your account and then Like the page. This is how it looks like when you obtained the redeem code. Once you have it, proceed to Appstore on your iPhone and scroll down to the bottom of the main page and tap on REDEEM. 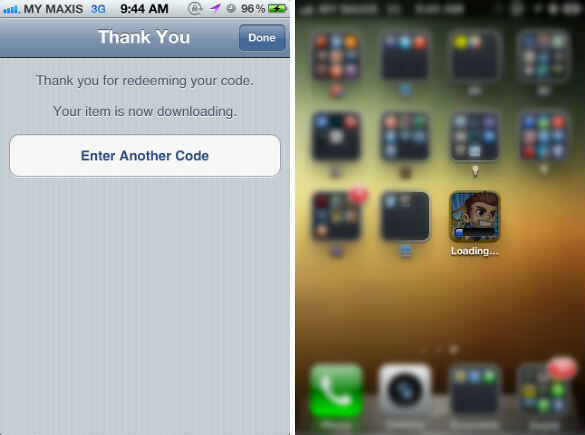 Once you have entered the code, ‘Jetpack Joyride’ will start downloading. ENJOY!